The Nobel Peace Prize was awarded on Friday to Al Gore, former American vice-president, and to the United Nations’ Intergovernmental Panel on Climate Change (IPCC), chaired by environmental scientist Rajendra K. Pachauri of The Energy and Resources Institute (Teri), for their work in alerting the world to the threat of global warming. The UN committee, a network of 2,000 scientists, has produced two decades of scientific reports that have “created an ever-broader informed consensus about the connection between human activities and global warming", the citation said. 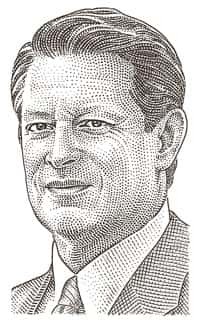 “We face a true planetary emergency," Gore said in the statement. “The climate crisis is not a political issue, it is a moral and spiritual challenge to all of humanity. It is also our greatest opportunity to lift global consciousness to a higher level." In New Delhi, Pachauri, who heads Teri and has lead the UN panel since 2002, said he was overwhelmed at the news of the award. “I expect this will bring the subject to the fore," he said. “I’m only a symbol of a much larger organization, the IPCC, and it’s really the scientific community that contributed to the work of the IPCC." The panel was established by the World Meteorological Organization and the UN Environment Programme in 1988. Pachauri, who has authored 21 books, was awarded the Padma Bhushan, one of India’s highest civilian awards, in 2001. “We would encourage all countries, including the big countries, to challenge, all of them, to think again and to say what can they do to conquer global warming," Mjoes said. “The bigger the powers, the better that they come in front of this," he added. The Peace Prize, he said, is only a message of encouragement, adding, “the Nobel committee has never given a kick in the leg to anyone." Global warming has been a powerful issue all this year, attracting more and more public attention. Gore’s film An Inconvenient Truth, a documentary about global warming, won an Academy Award this year. The UN committee has issued repeated reports and held successive conferences to highlight the growing scientific understanding of the problem. At the same time, signs of global warming are more and more apparent, even in the melting Arctic.